After an amusing late brunch at Terrapin in Rhinebeck, NY with our good friends Stan Gurell & Ira Howard Levy, all Cathie wanted for dinner was steamed Broccoli. Good for her!. Another chance for me to wolf down a pasta. 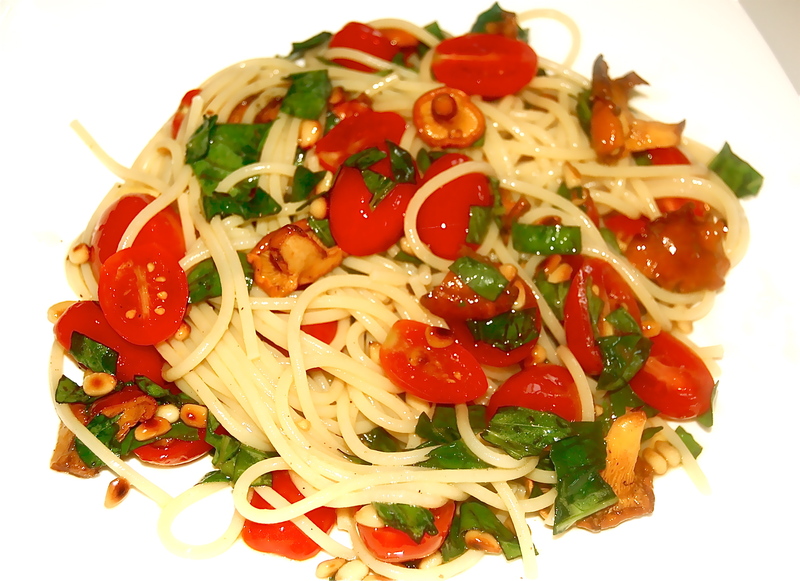 On this hot early evening my taste buds turned to spaghetti with tomato, basil & pignoli nuts. I then remembered that a few of those delicious chanterelles were still in the fridge, better eat them or they’ll go bad. As I commented in the description, ” Why do I only think of preparing this delicious pasta In the Summer? Because it is a plate of Summer. 1. Bring a pot of water with 1 TB of Salt to a boil. Add the Spaghetti & cook to al dente about 8 minutes (or follow the box directions). 2. In a mixing bowl, add the Grape Tomatoes or the Tomato, the Basil leaves, Pignoli nuts, Mushrooms & EVOO. 3. Season with the Salt, Pepper & Red Pepper Flakes.